Extreme rains are happening even now in South TN particularly in Tirunelveli ghat areas and Thoothukudi. It is the first 200 mm (red alert) rains recorded in this monsoon with Manimuthar Dam in Tirunelveli recording massive 286 mm rainfall. Extreme rains have been reported in South Tamil Nadu and it is the first station to record over 204.5 mm rainfall (red alert criteria of extreme rains) in this North East monsoon. Expecting Coutralam to flow with huge volume of water. 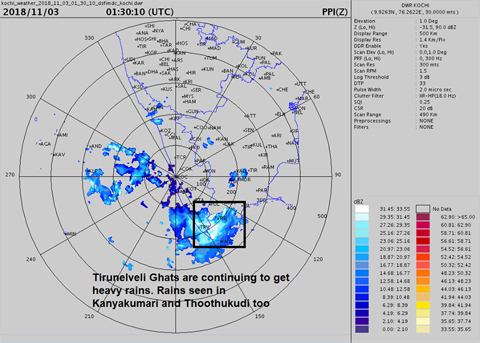 Good rains have been reported in Kanyakumari, Thoothukudi, Theni, Nagai, Thanjavur and Tiruvarur. Dry weather to continue for next few days except isolated sudden showers like today morning ones which is common during monsoon. Dry Diwali on cards not only for Chennai it will be dry in most parts of Tamil Nadu. Again south TN of Nellai, Kanyakumari and parts of Thoothukudi and Ramanathpuram will get rains. Nothing major seen in weather front in the coming days. I hope many would be saddened that the strong spinning thing which was crashing into Pondy on Diwali is not seen anymore and as expected it is expected to go to Sri Lanka as a weak one.